The furore over the South Africa captain's ball-shining techniques came to a head on Tuesday when he was found guilty of altering the condition of the ball by the International Cricket Council (ICC). .. .. what would be the reaction ? Australian attitude !! : Faf said he felt he did nothing wrong and "wasn't trying to hide it", but that is where the problem arose, according to Dirk Nannes. Speaking on Grandstand radio, Nannes said every team he had ever played on did a similar thing, but the players were simply smarter about not rubbing it in the face of the officials. Inflaming the situation, Hashim Amla then fronted a press conference with the team standing defiantly behind him, security chief Zunaid Wadee got physical with reporters and du Plessis said the ICC made him a "scapegoat". The reaction, which also saw du Plessis and Cricket South Africa chief executive Haroon Lorgat call for more consistency and clarity in the laws of the game, was "wildly inappropriate" according to Nannes. In the days when Australia's cricket team were all-conquering, Adam Gilchrist was frequently referred to as the side's allrounder, for his batting carried that kind of weight. On his recall to the national side in far grimmer times, Matthew Wade's allround responsibilities appear to be threefold: batting, wicketkeeping and "presence". While Wade insists that his glove work has gone up a notch or three since he was dropped for Brad Haddin ahead of the 2013 Ashes series, ending a run of 12 Tests behind the stumps, he also acknowledged his role around the team will be much more multifaceted than simply adding to his tally of dismissals. Wade made his test debut in Apr 2012 and played the last of his dozen tests at Delhi in Mar 2013. Coming back from wilderness, he has had a good opening day at Adelaide in Test no. 2236 – as South Africans slid to 259/9 decl. Wade held 5 catches. Du Plessis was unbeaten on 118 when he declared ! – yes declaration. Faf du Plessis declared South Africa's innings at the Adelaide Oval with only 259 runs on the board - their second-lowest total on which they have declared in the first innings of a Test. Colour is simply light of different wavelengths and frequencies and light is just one form of energy that we can actually see that is made up from photons. Colour, is the physical phenomenon of light or visual perception associated with the various wavelengths in the visible portion of the electromagnetic spectrum. As a sensation experienced by humans and some animals, perception of colour is a complex neurophysiological process. In science the primary colours are red, green and blue. This makes sense as it can be proved with a ray box. However, in art the primary colours are said to be blue, red and yellow and red which is believable as with these colours all other colours can be obtained. The retinas in our eyes though have three types of colour receptors in the form of cones. We can actually only detect three of these visible colours - red - blue and green. These colours are called additive primaries. It is these three colours that are mixed in our brain to create all of the other colours we see... We can see seven main colours of the Visible Spectrum. A sightscreen is used in cricket so that when the bowler delivers the ball, the batsman can see it clearly against the background. It also prevents any major distractions from occurring in that direction as the batsman is focusing on the ball. Now a days Cricket is a different ball-game - traditional red (Cherry); White (in ODIs) and now pink, to be precise, fluorescent pink at that. The come-back man has a serious trouble. 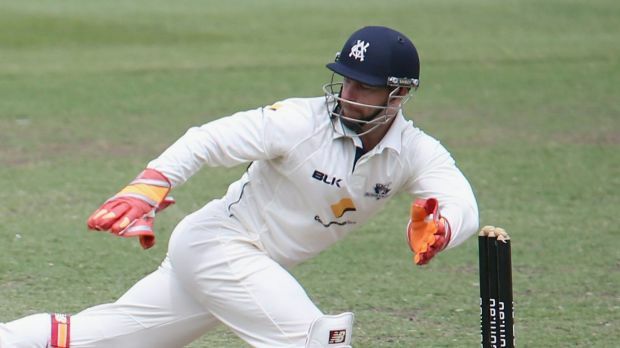 Australian wicketkeeper-batsman Matthew Wade, suffers from colour blindness. He however insists that he will cope with it in the day-night Test against SouthAfrica being played in Adelaide with the pink ball under lights. Wade has been recalled for the third and the final Test against the Proteas in place of Peter Nevill with Australia being desperate to evade a first-ever clean-sweep on home soil after humiliating defeats in Perth and Hobart. The Victorian gloveman, who was removed from the Test team three years ago due to due to shoddy glovework, has admitted that his vision problem makes it difficult for him to play with the pink ball under lights, but expressed confidence of adapting with it. "I think it's trying to get it out of your mind. I can see the colour of the ball, I pick it up. It's just at times it takes a little bit longer to work out the depth of where it's coming. It can't be an issue, I've got to work it out," he added. The 28-year-old further said that he now finds it easier to cope with the pink ball than when it was first rolled out as a Sheffield Shield experiment in the 2013-14 season.